A beautiful “duet” between two of the world’s most esteemed tobacco blenders - Rafael Nodal and the “Godfather” of boutique cigars, Ernesto Perez Carillo, Oliveros All Stars cigars spotlight a U.S.-grown Broadleaf Maduro wrapper around a carefully selected mix of Dominican filler & binder leaves. 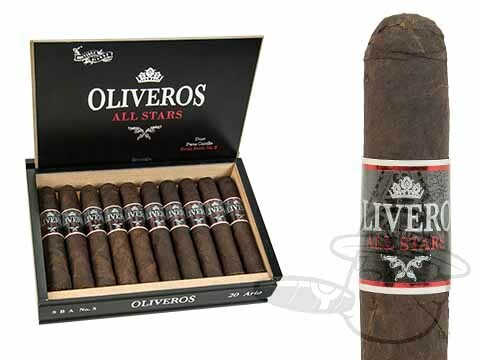 Lush with notes of dark espresso, rich earth, and cocoa sweetness, the Oliveros All Stars cigar brings you full strength and a harmonious bouquet of bold flavors with smooth delivery. What more could you ask for?